Professor Irena Sailer and MDT Vincent Fehmer from the University of Geneva are no strangers to Finland. 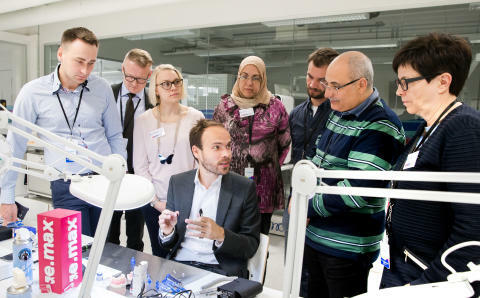 As lecturers for the Nordic Institute of Dental Education, they have been to the country several times in recent years and helped dental professionals from numerous countries expand their expertise in digital dentistry – a rewarding experience for course participants and the lecturers themselves. The Nordic Institute of Dental Education (NIDE) is a Planmeca subsidiary specialising in high-quality continuing education. It organises CE courses in Finland for dental professionals from around the world. NIDE has built a network of experienced, innovative, and inspiring lecturers to guide its courses covering 3D imaging, CAD/CAM dentistry, aesthetic dentistry, and more. Irena Sailer and Vincent Fehmer are lecturers for NIDE’s Aesthetic dentistry course in Helsinki, Finland. The next course will take place in September and both are already looking forward to it. “The course will help participants to understand the intricacies of chairside dentistry – how to successfully integrate digital workflows and how to utilise modern diagnostic tools to visualise treatment goals,” Sailer states. From planning and preparations to correct bonding, participants will also learn how to do minimally invasive dentistry and how to create defect-oriented adhesive restorations. “Understanding the indications for monolithic reconstructions is important, as they represent the keystone to a successfully integrated digital workflow,” Fehmer illuminates. Sailer and Fehmer reside in Switzerland where they work for the University of Geneva’s Clinic for Fixed Prosthodontics and Biomaterials. Sailer is also the Head of the university’s Division of Fixed Prosthodontics and Biomaterials, while Fehmer runs his own private dental lab in Lausanne. In their work, both have been able to closely follow how digitalisation has changed the daily lives of dental professionals. They have seen a significant shift in the field of aesthetic dentistry, as digital technology has opened new avenues to improve treatments. “Digital technology has enabled us to use new materials, such as reinforced glass ceramics. They can be manufactured to be very thin and in a highly efficient way. Also, new multicolour blanks have allowed the application of monolithic reconstructions even in the aesthetically relevant anterior area,” Sailer recounts. Irena Sailer showing the intricacies of aesthetic dentistry. Digitalisation comes with the rightful promise of great gains, but proper education always makes it much easier to get the most out of innovative digital dental equipment. As technology develops, continuing education plays a major role in conveying the latest knowledge and skills to users. The Nordic Institute of Dental Education set out to meet the growing needs in the field a few years back and has already solidified its place in the CE world. To date, NIDE has hosted dental professionals from over 40 countries at its courses. Sailer and Fehmer have enjoyed the experience of lecturing in Finland. They both see NIDE as filling a key role in the world of continuing dental education. “The Nordic Institute of Dental Education offers a great platform for skilled clinicians and technicians to exchange knowledge and learn the latest skills,” Fehmer comments. All NIDE’s courses are evidence-based and rely on scientific information. They are accredited by the University of Turku and recognised by the American Dental Association’s ADA CERP program. “NIDE’s courses are a well-balanced mixture of lectures and hands-on training. They provide clinically relevant and scientifically based content that is applicable as part of everyday work,” Sailer concurs. In addition to improving the efficiency and outcomes of treatments, digital technology also enhances the treatment process itself by promoting a mutual understanding and allowing patients to see simulations of the intended result. “New visualisation tools are changing the way in which we can communicate with our patients,” Fehmer asserts. All of the Nordic Institute of Dental Education’s courses are held in Finland. The majority take place in its beautiful capital city of Helsinki, with some organised in the coastal city of Turku nearby. Finland is an emerging travel destination – more and more people are becoming curious about its unique features and widely-publicised success story. With fresh air and thousands of clean lakes to offer, Finland’s natural beauty is also becoming better known throughout the world. Sailer and Fehmer are always happy to visit not only the country itself but also the Nordic Institute of Dental Education. They feel at home with NIDE, as its Finnish hospitality and well thought out schedule both in and outside the lecture room have certainly made a lasting impression. The Nordic Institute of Dental Education's next Aesthetic dentistry course will be held in Helsinki on 24–25 September, 2018. You can sign up for the course on NIDE's website.